The “holy grail” in time-lapse photography, is the smooth transition from daytime to nighttime, or from night to day. It can be quite tricky to balance the bright daylight with the low light levels of the evening … and then make it a smooth transition between the two. With a combination of specialized software programs, and dedicated time-lapse controllers … and a bit of experience, it can look really good. 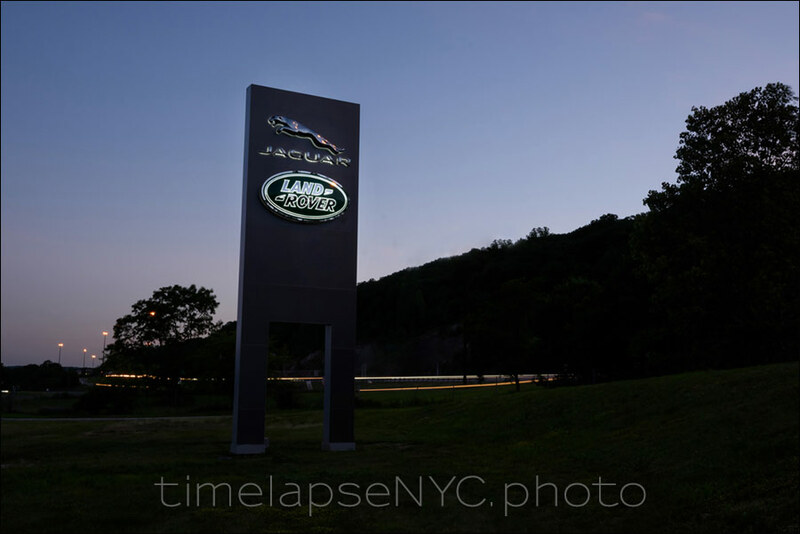 This time-lapse was shot for a client who created the signage for he Jaguar & Land Rover offices in NJ. The signs light up at dusk, and the client wanted to show daytime, and then how the signs look at night when lit up. This is where the a solid application of techniques to achieve this “holy grail” of time-lapse photography, comes in. Here I used 4 cameras for different angles. Speeding up certain sections actually helped in making the transition between day and night smoother. I actually went back to this for a second day of shooting, because the first day had no clouds. I felt that with the expansive view of the offices, I needed more than just a bland sky. I wanted some clouds to add movement to the final time-lapse video. Because of the scale of the place, I decided not to do motion time-lapse – there weren’t any relevant objects in the foreground that would’ve made motion time-lapse seem sensible. So I went with multiple angles with the various cameras. A photographer friend shot drone footage of the signs, and the client would combine the time-lapses with the drone footage to create a stunning promotional clip of their signage work for a premier company.